USD is rising against JPY. At the end of February, the instrument was corrected to the lower limit of the range at 110.35 and after a rebound, it formed a new rapid ascending wave to the upper border of the channel. Later, the pair reversed into the sideways consolidation within a narrow range of 112.00–111.75. The main growth catalyst remains the decline in investor interest in JPY and the increase in demand for USD. At the end of the week, a number of important releases will be published, which will support USD additionally, on the contrary, change the direction of the pair. In Japan, data on 2018 Q4 economic growth rates, as well as key indices will be published. In the United States, labor market statistics are expected to be released, including Unemployment Rate and Nonfarm Payrolls. The growth dynamics maintains. 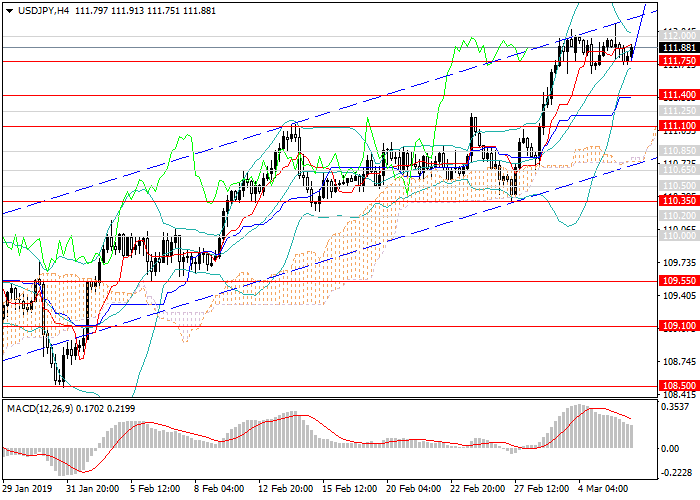 Before the upward wave formation, the price can be corrected to the levels of 111.10, 110.85. An alternative scenario would be a breakout of the local maximum at 112.00 and a rapid gain. In the medium term, the movement towards resistance levels of 114.00, 114.50 is predicted. Technical indicators confirm the growth forecast: the volumes of MACD long positions are growing, Bollinger bands are directed upwards. Support levels: 111.75, 111.40, 111.10, 110.85, 110.65, 110.35. Resistance levels: 112.00, 112.70, 113.00, 113.30, 113.90, 114.00, 114.50. It is relevant to increase the volumes of long positions from the current level and open pending long positions from the levels of 111.10, 110.85 with the targets at 113.00, 114.00, 114.50.